Trend Watch: We Have Forgotten To Look Up! Time to Look Up Again! In 2015 we will see statement-making ceilings. More emphasis will go into ceiling design, in terms of shape and features. Whether it be through the use of lighting, bulkheads or coffer ceilings, or the addition of classic embellishments, our ceilings will become part of the room’s beauty again. 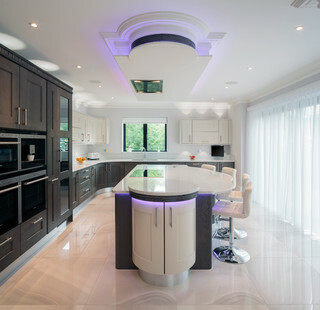 Not sure how to take your kitchen ceiling design to new heights? Look to the space here for inspiration. 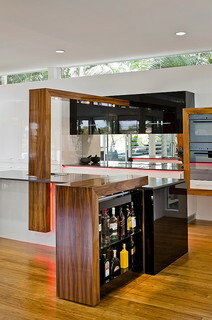 The show stopping kitchen (above) features a bulkhead with decorative molding, exotic zebrawood detailing and colored LED lighting. The wood design feature above that frames this kitchen thoroughfare and runs from one side of the island to the bank of cabinets on the opposite wall instantly draws the eyes up, as does the row of clerestory windows that creates the illusion of a floating ceiling.